I really like the look of FDS Jetmax, it looks amazing! 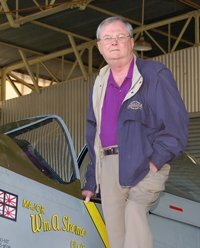 I'd love to build my own home cockpit but dont really fly one aircraft. I fly a mixture of the PMDG 737 and 747, and soon to be 777. Maybe i shouldn't get a home cockpit and try to build something generic? I'm really looking for the MCP; PFD, ND and UE, LE displays; throttle; CDU; yoke; pedals. the rest of the cockpit can wait for the moment. Recommend you do a little more research before you embark on that journey as right now you are all around the world. Check out mycockpit.org or cockpitbuilders.com for ideas that might appeal to you. Avsim's home cockpit contributors are a very small niche within a niche. Something else you need to consider is how your sim is going to be setup. Are you going to run on a single computer or go the network route to spread the load. If your single computer is already struggling with FSX, you will be disappointed with your home pit. If you plan to go networked, you need to be prepared of the cost of software. You normal addon planes will not be sufficient as they are not designed for home cockpit builders. You will require software specifically made for a networked simpit. This then brings on another issue, most software is aircraft specific, the 737NG being the most popular. You will havevmany choices with this aircraft, but will find your options dwindle as you look for otbers. As stated above, a lot of self research is necessary. Build in parts, the only way. I've got the jetmax throttle; next will be the MCP; then a 1080p projector, then the 737-yoke, the MIP, etc. You have to think about visuals as well -- TV, LCDs or projector? flat or curve screen? The Jetmax kit states on their website it is compatible with the PMDG 737NGX. I already have 3 24" screens which will suffice. Yes it is compatible with a single computer setup only. Or you can go inbetween with a mixture of real and custom parts like I did with my desktop cockpit. This is my 737 setup but I can easily use it for upcoming PMDG 777 or even a 747 with combined throttles. I have 1 PC (on the right) with 2 video cards running the whole thing with 5 monitors. The PC on the left is used for EFB and internet while flying on the little monitor to the left that's off. The overhead is removed in this shot as it's still being worked on it but can mounted to the stand over the monitors for flights. Wow awesome your setup has given me loads of ideas So you have the jetmax throttle, Golfight MCP and what CDU? Thanks :)The throttle is the Jetmax 737TQ, the MCP is an Opencockpits V2 and the CDU is an Opencockpits FMC kit I built. Thanks The throttle is the Jetmax 737TQ, the MCP is an Opencockpits V2 and the CDU is an Opencockpits FMC kit I built. Cool is the EFIS OC as well? Is your CDU and radio stand custom? The EFIS is just rotary switches and text I built into my custom MIP Panel I had fabricated. The CDU bay I bought from Gold Medal. Thanks. 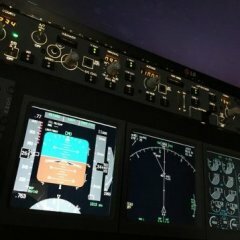 What software does the throttle use to connect to the PMDG 737? It is jetmax's own? Just thinking how compatible it is with the PMDG 747. I just use FSUIPC to assign all the axis and switches to the PMDG controls. The TQ shows up in Windows as a joystick so you can set it up like another joystick. This is my old Queen of the Skies setup. It worked and most of the parts were second hand so it was affordable. Also allowed me to fly any of my favorites.